Fun & Easy River Float. Free Delivery Available in Crested Butte! We offer premium inflatable stand up paddle boards & river float tubes from NRS. Brand NEW rental fleet – Summer 2017 – Youth specific SUP, We have 4” & 6” Inflatable SUP, River/ Wave Riders and Fitness/ Yoga Lake SUP too. -NRS inflatable paddle board with fins, adjustable SUP paddle, PFD. We provide all necessary straps for securing SUP to your vehicle. No racks, no problem, we also offer shuttle services to many locations. Dry bags are available to keep your personal items dry and safe! What to bring: Camera, sunscreen, hydration and snacks, towel, water shoes, wet suit or other cold water immersion clothes (Spring only), sun glasses with safety strap and a great attitude for the day! The Float-Shack will provide all straps and instruction to safely attach the stand up paddle boards to your vehicle. Our SUP paddles break down for easy transport. Call the Float-Shack at (970) 209-9747 or BOOK HERE to make a reservation. We have several 1/2 day and full day SUP rental options and areas to float. 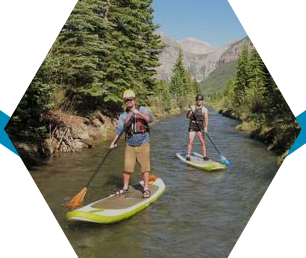 The Float-Shack Crested Butte, CO is very passionate about stand up paddle boarding and will offer their extensive knowledge of the Crested Butte and Gunnison areas. 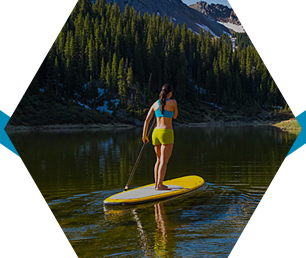 We are known to leak all of our best kept secrets on paddle boarding in Crested Butte. Lake Irwin offers placid alpine lake adventures, great fishing and camping too. The Slate River works it way around Crested Butte, just east of the mountain face. The two sections offer great scenery on swift flat water, no whitewater. 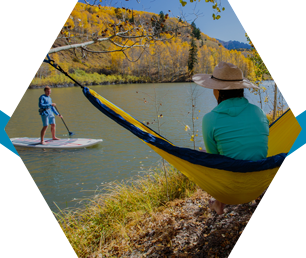 Gunnison offers the Blue Mesa, the largest body of water in Colorado and some spectacular SUP paddling areas. Give the Float-Shack a call now at (970) 209-9747 and let us help create the perfect stand up paddle boarding adventure for you and your crew. My family and I had an excellent time paddle boarding with the Float Shack. Irwin Lake is beautiful. The mountain peaks surround the lake. Our rentals were terrific. The staff was great. Got us up and going fast. We will be back! Helmet, Wrist Guards, Knee & Elbow Pads included with every package.